The New Mexico True Certified program brings national attention to the quality, care and craftsmanship behind products that are uniquely New Mexican, while providing opportunities for businesses of all sizes to integrate the New Mexico True Certified mark on packaging, fulfillment, and marketing materials. Click HERE to view evaluation criteria and ensure your business and its product(s) meet the minimum requirements. The specific products for which your company is seeking New Mexico True certification. Initial thoughts on how you would use the New Mexico True Certified mark if approved (e.g., packaging, website, marketing materials, merchandising, point of sale, signage, press release or other public relations outreach/materials, trade show display, storefront, etc.). See examples and mockups here. If you are applying for “100% Made in New Mexico” certification: Photos or other evidence/documentation (such as lease or contract manufacturer agreement) of New Mexico-based facilities for the production of your product(s). Acceptable formats for upload include .jpg, .png, and .pdf. If you are applying for “100% Born & Raised in New Mexico” or “100% Grown in New Mexico” certification: Source-verified third-party documentation from NMDA or qualified company such as Where Food Comes From, Inc. Must be in .pdf format for upload. The New Mexico Tourism Department will review completed applications and supporting evidence. A representative will be in touch shortly thereafter. 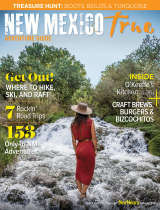 The New Mexico Tourism Department reserves the right to deny participation in the New Mexico True Certified Program for any reason including non-compliance with any local, state or federal laws.